Find out what's going on among local banks -- who are some of the new faces, how are banks holding up against competition -- in this annual report. We'll profile local banking leaders and share FDIC data on their institutions. The past year has brought many successes for Security Business Bank of San Diego: an $8.9 million capital campaign; a new full-service branch in North County; and a year of strong profitability. The man responsible for leading the bank through this extraordinary period of growth and expansion is President and CEO Paul Rodeno. A San Diego resident since 1965, Rod Calvao understands San Diego County Credit Union's customers and the community. In 1981, still in its infancy, San Diego National Bank was just beginning to grow beside the large homegrown savings and loans. Robert Horsman was then senior vice president of SDNB's lending division, and he helped sell stock in the bank's initial $9 million capitalization. Today, Horsman is the president and CEO of SDNB and, thanks in large part to his influence, SDNB has become the region's largest locally headquartered community bank with assets in excess of $2.3 billion. Inspired by the credit union's vision of providing people the means to achieve their dreams, Michael Maslak, president and CEO of North Island Credit Union, oversees a world-class organization of business and administrative talent committed to providing exceptional financial services. This year marks the 10th anniversary of Ron Martin's arrival to Mission Federal Credit Union. As President and Chief Executive Officer of Mission Fed, Martin has successfully steered the $1.9 billion institution through many changes over the past decade, including opening up the credit union membership to all of San Diego County. When Vincent Siciliano joined 1st Pacific Bank of California in 2001, he wanted to incorporate what he believes to be the key to successful banking - a relationship culture. Jim Kelly, president and chief executive officer of Discovery Bank, wants you to "discover banking the way you want it." Michael J. Perdue is president, chief executive officer and a member of the board of directors of Community Bancorp Inc. and Community National Bank. Stephen Gordon is the founding chairman and chief executive officer of Commercial Capital Bancorp Inc. and its subsidiary companies Commercial Capital Bank, Commercial Capital Mortgage, Commercial Capital Asset Management, and ComCap Financial Services. He is also chief executive officer of TIMCOR Exchange Corp. Additionally, Gordon serves as chief executive officer of the Commercial Capital Bank Community Foundation. As the fourth quarter of 2005 approaches, Temecula Valley Bank will celebrate its ninth year of operation. The bank enjoyed a 33 percent increase in earnings for the first sixth months of 2005 and has grown to a $700 million commercial bank. When Chris Skillern was named managing director for California Bank & Trust, San Diego division, in May of 2001, the promotion was merely the latest advancement in his successful banking career. Our team is proud of our accomplishments in 2004 as Sunrise Bank of San Diego achieved record profitability. When Larry Willette agreed to meet with Mike Perry in April of 2002 to discuss the idea of forming a new bank, he did so mainly out of professional courtesy. Too many businesses fail because they're undercapitalized. But this certainly doesn't happen because there's not much capital available. Money's there. You just need to know where to find it and what kind of loan is best for your business. California Community Bank opened for business Aug. 11, 2003, and closed the second quarter of 2005 with total assets of $75 million, deposits of $66 million and total loans of $51 million. Commercial Capital Bank (CCB) is the fastest growing savings institution in California, according to FDIC.gov, based on the percentage growth in total assets over the 36 months ended March 31, and a leading income property lender. Community Bancorp Inc., the holding company for Community National Bank, has just completed one of its most successful and eventful quarters ever and it has been a privilege for me to lead the company and its outstanding employees. We have completed the acquisition of Rancho Bernardo Community Bank, received national and industry recognition for our performance and become one of the premier financial institutions in San Diego and Riverside counties. Looking at the performance of 1st Pacific Bank of California, a pattern of consistent, strong and steady growth emerges. Founded in late 2000, the bank recently announced a fifth regional office, assets of more than $230 million and its first stock split in June. It also has been named a Super Premier Performing bank and the 2005 de novo (less than five years old) "Bank of the Year" in California by "The Findley Reports." San Diego-based Imperial Capital Bank (ICB) is a familiar presence throughout Southern California. To both individual account holders and businesses with expanding operations, ICB is anything but typical. Under its parent, ITLA Capital Corp., the largest publicly traded financial institution headquartered in San Diego, ICB has proven to be a thriving, energetic, entrepreneurial institution, willing to take the business of banking in exciting new directions. Eleven years ago, Mission Federal Credit Union saw a unique need in the education community. A fledgling school for homeless youth needed financial support for programs and facilities for its underserved students. As a long-time supporter of education from the day it opened its doors in 1961 as the Public Schools Federal Credit Union, Mission Fed made the determination to host and organize an annual benefit golf tournament. North Island Credit Union has hit upon a marriage of convenience in a new wedding gift registry program - the MatriMoney Wedding Gift Registry Program. Since 1981, San Diego National Bank (SDNB) has grown from a small community bank to an easily recognizable name throughout San Diego County. Today, SDNB is the largest locally headquartered bank in San Diego. Founded on its commitment to provide exceptional local service to the San Diego community, SDNB now has more than $2.3 billion in assets and 21 branches throughout the county -- with plans to open several more in the future. The landscape of the San Diego community banking scene continues to evolve. New banks continue to be formed, while others are acquired or merged into larger entities. Retirement, regardless of your age, is always closer than it seems and smart planning at every age is critical. Founded by respected local business leaders, Security Business Bank of San Diego offers a full range of banking, investment, cash management, real estate and SBA lending services at their downtown and North County offices. One of the most pressing issues for business owners looking to expand or grow their business is determining whether to lease or to buy. Temecula Valley Bank, a wholly owned subsidiary of Temecula Valley Bancorp Inc., is a $700 million commercial bank serving communities throughout San Diego and Riverside counties. The bank operates full service offices in Temecula, Murrieta, Corona, Fallbrook, Escondido, Rancho Bernardo and El Cajon, with SBA loan offices in California (Anaheim Hills, Irvine, Glendale, Thousand Oaks, Fresno, Sacramento and Stockton); Washington (Bellevue); Colorado (Englewood); Oregon (Lake Oswego); Texas (Dallas; Houston); Georgia (Jesup); Florida (Tampa, St. Petersburg, Coral Springs, Jacksonville and Orlando); Ohio (Kirtland and Dublin); Illinois (Gurnee); New Jersey (Ocean City, Randolph, Basking Ridge); and North Carolina (Clemmons). Pacific Coast National Bank opened its doors on May 16 in Encinitas and San Clemente with a handpicked group of highly experienced bankers and $22.8 million in capital, far exceeding the $17 million goal. Among the most important things you can do to get the best deal on a loan, a credit card, insurance and other financial products is to make sure your credit record is accurate and in its best possible shape. Why? Because even a modest improvement in your credit reports (your history of paying debts and other bills) and your credit scores (numerical ratings of your credit history used by companies in making business decisions) can improve the offer on a financial product you may want. Read about local banking leaders and their financial institutions, national industry trends and more. Read about local banking leaders and their financial institutions, how to invest in this economy, national industry trends and more. Read about local banking leaders and their financial institutions, investment information, economic indicators and more. 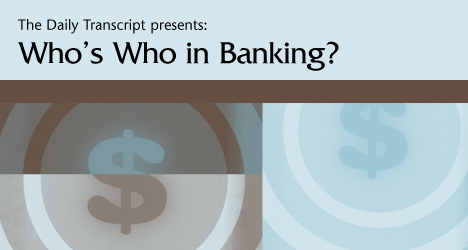 This annual publication focuses on local banking leaders and their financial institutions. Read about local banking leaders and their financial institutions, and how they're handling the current financial crisis. Read about local banking and finance executives, updates on real estate financing and subprime loans, Internet banking and more in this special annual report. San Diego's economy remains dynamic and robust, and competition among area banks remains tough. Learn more about who's who in San Diego banking as we profile local leaders in this annual report.